These elegant nut and candy gifts are sure to please. 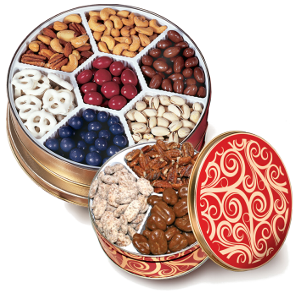 Grande Golden Selection - An elegant golden gift tin, generously filled with seven varieties of delicious candies and nuts: Roasted Cashews, Premium Pistachios, Chocolate Blueberries, White Chocolate Dipped Pretzels, Deluxe Mixed Nuts, Chocolate Covered Almonds and Chocolate Cherries. Southern Gourmet Pecan Tin - A colorful red/gold collector tin filled to the brim with Chocolate Amaretto Pecans, Praline Pecans and Roasted Salted Pecans. Sign up to be notified when Nut Candies are in season. These Tempting Gifts of Nuts and Candies are available November through April.